A plant cell diagram, like the one above, shows each part of the plant cell including the chloroplast, cell wall, plasma membrane, nucleus, mitochondria, ribosomes, etc. A plant cell diagram is a great way to learn the different components of the cell for your upcoming exam. Plants are able to do something animals can’t, photosynthesize. Plant cells are able to do this because plant cells have different organelles from animal cells. How exactly do plant cells differ from animal cells? Let’s take a closer look at the differences between plant and animal cells by going over a diagram of plants cells and exploring all their parts. To begin with, the outside of a plant cell is enveloped by a structure known as a cell wall. The cell wall gives support and protection to the entire cell. It must be rigid enough to support the cell, yet permeable so that materials may move in and out of the cell. The cell wall of the plant is made out of a strong carbohydrate polymer known as cellulose. Cell walls are found in plants, as well as fungi and algae, but not the cells of animals. When a plant cell divides, it grows a new cell wall down the middle of the parent cell. Inside of the cell wall is the plasma membrane, which holds the contents of the cell, like the cytoplasm, inside of it. Like the cell wall, the plasma membrane is semi-permeable. The function of the plasma membrane is to keep certain substances in while keeping harmful substances out. It also plays a role in regulating the growth and balance of the cell. The cytoplasm makes up most of the interior of a cell, and it consists of a jelly-like substance. Various materials vital for the survival of the cell, like salt, water, and enzymes float around in the cytoplasm, as do the various organelles of the cell. The cytoskeleton is sub-structure of the cytoplasm and it consists of various fibers which run the length of the cytoplasm and help the cell maintain its shape. The nucleus is often referred to as the “brain” of the cell and it controls the cell’s reproduction and growth. The hereditary information of the cell, its DNA, is stored here. 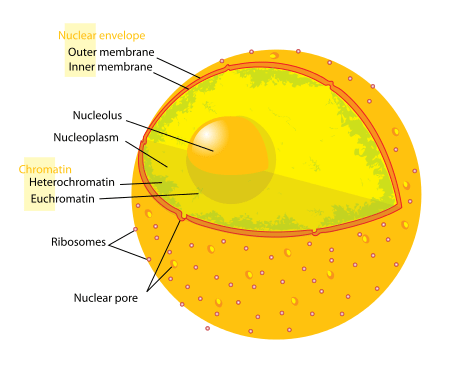 There is a smaller organelle within the nucleus, called the nucleolus. The nucleolus helps synthesize ribosomes. The nucleus is covered by a nuclear membrane and full of holes referred to as nuclear pores, which enable materials to move in and out of the nucleus. The endoplasmic reticulum is an important organelle for eukaryotic cells, and it is responsible producing and transporting lipids. Proteins and lipids are created by the endoplasmic reticulum for use in other areas of the cell. There are two parts to the endoplasmic reticulum, the rough endoplasmic reticulum, and the smooth endoplasmic reticulum. 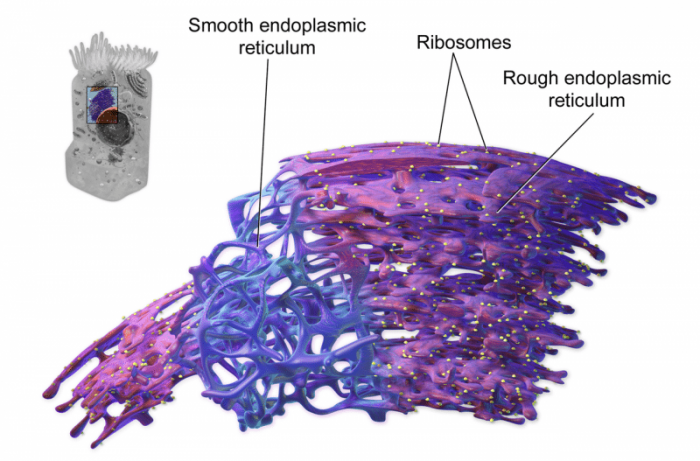 The rough endoplasmic reticulum is called that because it is covered in ribosomes, while the smooth endoplasmic reticulum is not. The Golgi body, sometimes called the Golgi apparatus, is an organelle which is responsible for manufacturing and shipping things like protein and lipids to other parts of the cell for use. The Golgi apparatus handles many of the products produced by the endoplasmic reticulum. Molecules are modified as they move between the different layers of the Golgi apparatus, and once they reach the surface, they are packaged in vesicles and sent to other areas of the cell. Chloroplasts are the organelles responsible for photosynthesis in plants and other photosynthetic organisms. As such, animal cells don’t have chloroplasts. 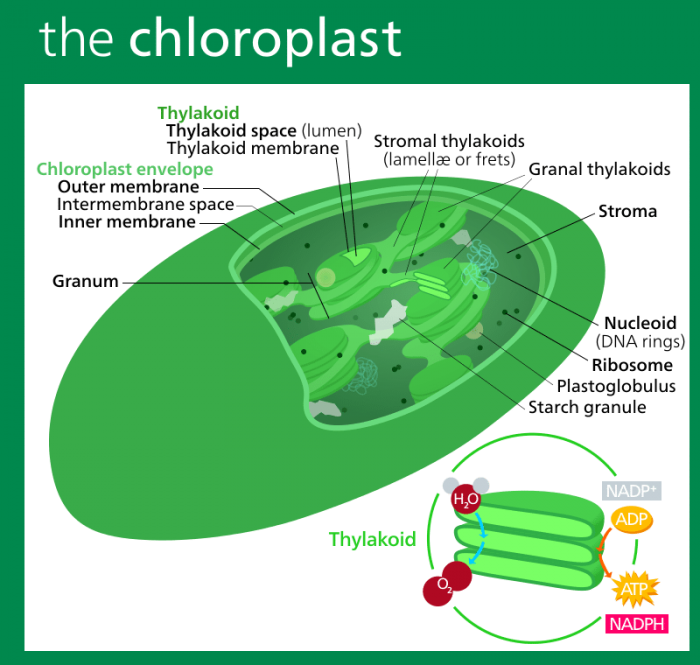 Chloroplasts have two different components: plastids and pigments. Plastids are responsible for storing and harvesting the components required to produce energy, while pigments are what absorb light energy. Different pigments are capable of absorbing different parts of the visible spectrum. Chlorophylls can absorb the red and blue wavelengths of light, and they are also what give plants their green color. Other pigments exist though, such as carotenoids and phycolobins. The mitochondria of cells are sometimes referred to as the “powerhouse” the cell. This is because the mitochondria are responsible for generating the energy that the cell uses. Mitochondria are found in both plant and animal cells. Mitochondria create ATP during the process of cellular respiration. For plants, this involves turning water and carbon dioxide into energy. Peroxisomes are involved in the process of photorespiration, which is how plants respire when carbon dioxide levels are too low. They are also used in the conversion of fatty acids to carbohydrates, so the plant can germinate seeds. Peroxisomes even convert hydrogen peroxide into water. Ribosomes are the organelles which are responsible for handling the process that synthesizes proteins. They can be found floating free in the cytoplasm of the cell or attached to the rough Endoplasmic Reticulum. Ribosomes are made out of two parts, a small ribosomal subunit and a large ribosomal subunit. The ribosomal subunits are created in the nucleolus of the cell. Ribosomes work alongside the molecule tRNA, or transfer RNA to ensure that the genes encoded into Messenger RNA (mRNA) are formed into the right proteins. The ribosomes are responsible for building polypetide chains out of amino acids, which will eventually end up as functional proteins. Vacuoles have many different roles within a cell. They are the organelles in a plant which assist in transportation, protection, detoxification, and growth. Plant cells often have one large vacuole when fully matured, and this vacuole can easily account for 90% of the cell’s volume. By contrast, newly developing cells usually have more vacuoles, though they are substantially smaller. Vacuoles help control turgor pressure and aid in growth by exerting pressure on the cell walls. The vacuoles of plants also help protect the cell, as they nullify toxic substances, like poisons and heavy metals, found within the cytosol of the cell. 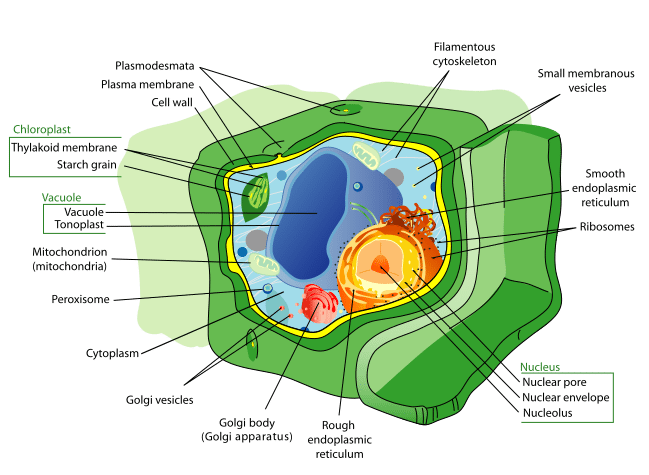 The various organelles within a plant cell all work together to form a complex system that allows the cells to grow, multiply, and make up the wide variety of plant life in the world.